Chelsea manager Maurizio Sarri says their Europa League game against MOL Vidi is a “difficult match to prepare for” with nothing on the line. The Blues boss confirmed he will play a weakened team with top spot in Group L already guaranteed after five wins in their opening five games. “Tomorrow we have three 2000-born players in the 18,” Sarri said. He added: “The last match [against Vidi, a 1-0 win] was really very difficult because they defended very well, with low density. It was difficult for us to score. First-team regulars Kepa Arrizabalaga, Antonio Rudiger, Eden Hazard, Cesar Azpilicueta and N’Golo Kante have not travelled to Budapest. 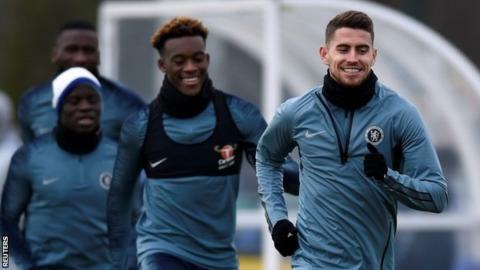 Sarri says Ethan Ampadu is likely to play, with centre-back Gary Cahill injured, and fellow teenagers Callum Hudson-Odoi and George McEachran are also in the squad. “I don’t think in Manchester City or Manchester United or the other big teams there are 2000-born players with a lot of minutes,” the manager said. “To play in these teams is really very difficult, but I hope in the future there will be a chance for Callum and Ampadu. MOL Vidi can still qualify for the last 32, but they would need to better Bate Borisov’s result at PAOK Salonika at the same time. Boss Marko Nikolic said: “Back in September nobody thought that this game would have any importance going into the final match. We have represented Hungarian football well in Europe. “We come up against the most difficult opponents, Chelsea. My players have shown previously that they can come up with wonders and now they have the chance to do the same against the Londoners. MOL Vidi (formerly called Videoton) have hosted an English side in European competition just once before, beating Manchester United 1-0 in the 1984-85 Uefa Cup quarter-final second leg, progressing on penalties. Chelsea have attempted the most shots in the Europa League so far this season (118) but 35 teams have a better shot conversion rate than the Blues (8.5%), who have scored with just 10 of these shots.